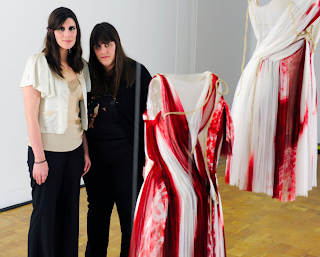 Kate and Laura Mulleavy are the sisters behind the fashion label Rodarte--the brand's name comes from their mother's maiden name. The Mulleavys are from Pasadena, California, and they've both graduated from U.C. Berkeley. At only five years old, the fashion house based in Los Angeles (a rarity), has already received much critical acclaim. Because their work (particularly in their earlier stage), had a lot of beautifully and fresh hand-worked-features, their efforts are often referred to as American couture by the fashion industry. In fact, their initial small collection landed them on the cover of Women's Wear Daily (WWD), as well as meeting with American Vogue Editor-in-Chief, Anna Wintour. 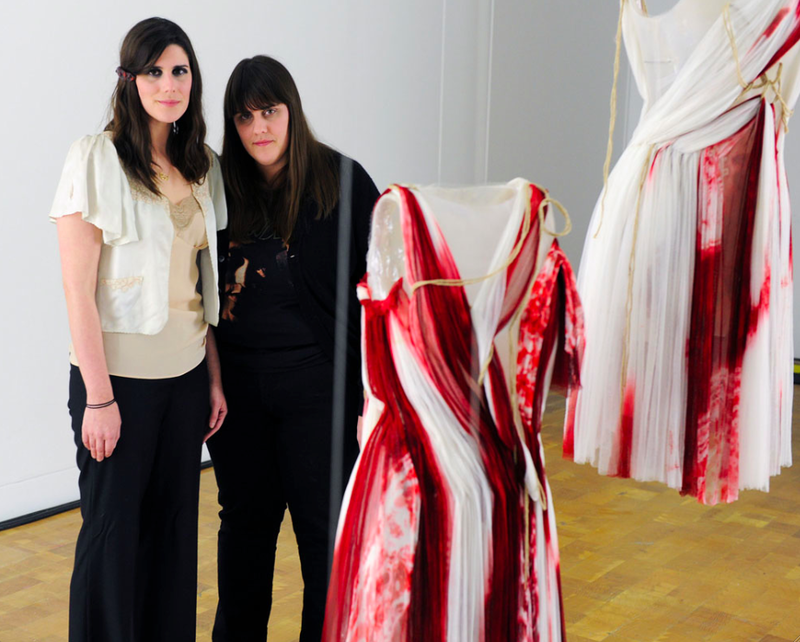 In 2008, Rodarte won the Swiss Textiles Awards; they were not only the first women to have earned this recognition, but Rodarte was also the first non-Europeans to receive the award. This year, the Californian designer sisters are showing their first solo exhibition at the Museum of Contemporary Art in Los Angeles (MOCA) until June 5th: States of Matter. 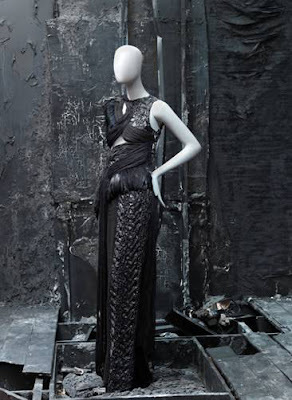 The show focuses on Rodarte's Fall/Winter (F/W) collection 2010, as well as Spring/Summer (S/S) 2010. The exhibit is divided into the two sets of seasons: the S/S representing an all white affair--vis-á-vis the robust and vivid cluster of blacks for F/W. "The black pieces are based on the Californian Cadors--endangered birds from Northern California: Magnificent, mangled, yet a powerful, and strong pack of birds," explains Laura Mulleavy. Perhaps Laura was also unconsciously referencing Rodarte's position in the fashion world: they represent the minute fashion talents that hail from California--and yet they are magnificent and strong indeed. The couture sisters are also publishing their first art book to come out this summer on June 30, entitled: Rodarte Photographs by Catherine Opie and Alec Soth. It's a collaboration between the designers and the photographers. Kate Mulleavy describes their goal for this project as "mapping our clothes as portraits, including all the places in California that has really influenced us--places where we grew up--the Santa Cruz landscape." Needless to say that the west coast duo are incredibly proud of where they're from, how they got to where they are, and who they represent: they are part of the new fashion generation who have swept off the fashion runways by their feet. The Rodarte sisters have invented their own signature of drapery, patterns and layering techniques--often playing with textures to get their vision across for the fashion world not just to recognize, but to honor. Rodarte has also successfully teamed up with the Gap and Target in the past. Going into their sixth year of what we can call a renowned fashion career thus far, the Mulleavy sisters both only in their early 30's, have certainly spread their Cador wings to date. But don't take our word for it, check out their F/W collection from 2010 (below), and see the talent for yourself. For more information about Rodarte's States of Matter at the MOCA, go HERE. To pre-order Rodarte Photographs by Catherine Opie and Alec Soth, go HERE. Or click below.